Barents Observer, Feb 19, 2017: … radioactive Iodine-131 of unknown origin was in January detected over large areas in Europe. Since the isotope has a half-life of only eight days, the detection is a proof of a rather recent release. Where the radioactivity is coming from is still a mystery… Iodine-131 in the air could come from an incident with a nuclear reactor… Someone out there knows why the radioactivity was spread over larger areas of Europe… Nuclear installations [where] radioactivity was first discovered, includes nuclear power plants in Finland, Sweden and Russia… The source could as well come from even further away installations. 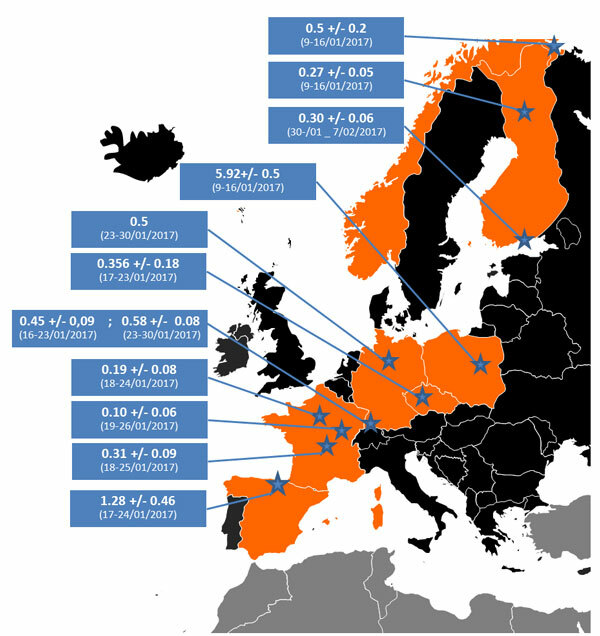 IRSN (France’s Radioprotection and Nuclear Safety Institute), Feb 13, 2017: Iodine-131 (131I), a radionuclide of anthropogenic origin, has recently been detected in tiny amounts in the ground-level atmosphere in Europe. The preliminary report states it was first found during week 2 of January 2017 in northern Norway. Iodine-131 was also detected in Finland, Poland, Czech Republic, Germany, France and Spain, until the end of January. Iodine-131 is a radionuclide with a short half-life (T1/2 = 8.04 day). The detection of this radionuclide is proof of a rather recent release… the origin of which is still unknown… Lead-210 [concentration detected by IRSN peaked at 1600 µBq/m3 in January, four times higher than the usual mean value]… It must be pointed out that only particulate iodine was reported. When detectable, gaseous iodine is usually dominant and can be estimated to be 3 to 5 times higher than the fraction of particulate iodine. In France, particulate 131I reached 0.31 µBq/m3 and thus the total (gaseous + particulate fractions) can be estimated at about 1.5 µBq/m3. ← — Another cover-up: new UK study finds 110 MoD nuke accidents — 4X higher than reported by govt.